More than 11,000 fans filled the Alamodome Saturday, July 21 to watch the top 12 drum corps go head-to-head for the second time this summer at the DCI San Antonio Southwestern Championship in Texas. The Blue Devils (91.350) won the evening's competition, flying past the Cavaliers (90.925) and the Cadets (90.250), showing that they have the wings to keep themselves up top on the road to the World Championships. 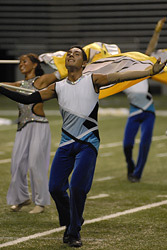 The Blue Devils have remained undefeated in their last eight competitions, but as the top three corps all break the 90-point mark for 2007, distinguishing a clear winner for the Finals will not be easy to do. "[The competition] is very tight. 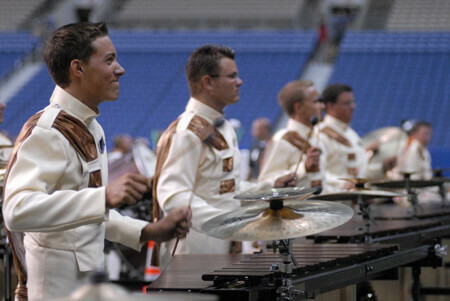 The top three corps are within tenths of each other," said Scott Johnson, percussion caption head for the Blue Devils. "It's going to be a dogfight to the end this season as it usually is. I'm excited because the top 12 corps this year are really good. I think everybody's level of excellence has gone up a lot. It's amazing to see and it's great for the activity." The Bluecoats (89.075) took the fourth place position at tonight's competition, and Carolina Crown (87.925) continues to climb the competitive ladder, finishing in fifth place, beating the Phantom Regiment (87.375) for the very first time in the corps' history. Santa Clara Vanguard (86.250) earned the seventh place title, finishing ahead of the Boston Crusaders (84.500) and Blue Knights (81.300). The fist-year Division I corps, the Academy (78.975), ended the night in 10th place, as the Colts (78.825) and Glassmen (77.900) closely followed. The 12 corps will now separate throughout the United States again, as half will travel toward Indianapolis this week, and half will go toward Denver. The next time these 12 corps will see each other head-to-head will be in Pasadena for the Drum Corps International World Championships at Rose Bowl Stadium. Although the 2007 Summer Music Games Tour may only have a few weeks left, the excitement is far from over.